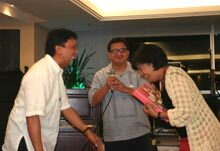 LP President MAR Roxas and Mrs. Drilon toast former Sen. Drilon. The Liberal Party of the Philippines (LP) has held the leadership of the Council of Asian Liberals and Democrats (CALD) for the last two years. Former Senator Franklin Drilon served as chairman while Dr. Neric Acosta was secretary-general. 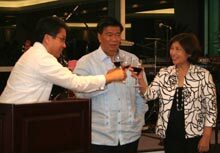 In tribute to their contributions to CALD and the cause of liberalism worldwide, the Friedrich Naumann Foundation (FNF) and CALD honored former Sen. Drilon and Dr. Acosta on 18 December 2007 in Quezon City. LP President MAR Roxas toasted former Sen. Drilon’s principled leadership, and former representative Dina Abad spoke of Dr. Acosta’s ability to bridge cultural gaps and bring political leaders from different backgrounds together. Siegfried Herzog, FNF resident representative, pointed out the significant role that former Sen. Drilon and Dr. Acosta had played in bringing Philippine and Asian liberal concerns to a wider audience. Former Rep. Dina Abad thanks Dr. Acosta. John Coronel, former CALD executive director, looks on. Usually all politics is local, but that evening the wider context in which the LP forms part of a global network of like-minded people was emphasized. This was largely due to the work of Sen. Drilon and Dr. Acosta.